Updated Monday October 24, 2016 by Saskatoon Minor Basketball. Come and celebrate the 2016 CIS Women's Basketball National Champions!! The tradition of this event is to kick-off another exciting Canadian Interuniversity Sport (CIS) season. The Raise a Paw Scholarship Brunch has generated over $125,000 in the past 16 years for the Huskie Women’s Basketball program through generous ongoing support of individuals and businesses. By generating scholarship assistance for student athletes we keep our programs competitive with other universities, recruit outstanding athletes, and help to keep our best and brightest in Saskatchewan. We are proud of our Huskies Basketball team and want to raise their profile and acknowledge their dedication. Go Huskies! Click HERE to purchase your ticket online today. 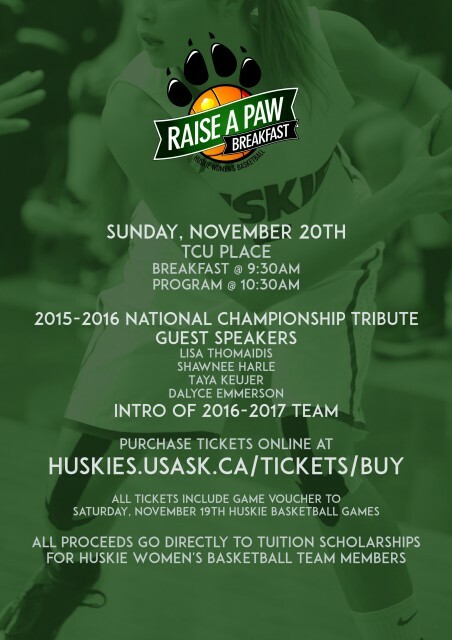 Can't attend the 2016 Huskie Women's Basketball Scholarship Brunch and still want to contribute? Considering making a donation to the Scholarship Brunch to help us with our goal to provide financial assistance to all Women's Basketball Team Members. It's time to reconnect with the Women's Basketball Program and your old teammates! If you haven't been contacted regarding our Annual Alumni Reunion Weekend, please contact us so we can fill you in on all the exciting activities in conjunction with the Scholarship Brunch. Tell me more about the Alumni Reunion!